Vautron Rechenzentrum AG Review 2019: Is Vautron Rechenzentrum AG a Good Hosting? Vautron Rechenzentrum AG is a premium German provider that offers both domain registration and web hosting services. Established since 1996, this company focuses specifically on enterprise-level requirements. Founded in 1996, Vautron Rechenzentrum AG is a well-established website hosting provider based in Germany. They claim that they’re a leading provider of domains with a registry of over one million domains; however, they do not advertise how many customers they currently serve with their web hosting platform. Their website and service is mainly in German, but their customer support is also available in English. Vautron Rechenzentrum AG is an enterprise-level website hosting provider, so they don’t provide shared hosting services. Instead, they focus on dedicated servers, virtual private servers, high-class servers, and special servers. Their hardware is top-notch. They operate four Tier III and Tier IV data centers with 24/7 on-site staff, have an service level agreement (SLA) of 99.5% availability, and use 100% green electricity. Their processors are Intel Xeon E3-1230 QC and they have IPv4 and IPv6 address networks. What I really like about Vautron is their flexibility and options for customization. Though they did have base packages I could select, I could also choose to customize my plan in a multitude of ways during the checkout process. Options included but were not limited to: extra RAM, optional RAID hardware, bandwidth, and backup frequency. As Vautron is designed for large businesses with complex needs, they do not advertise their prices on their website. They do, however, provide baselines of their packages, which can be customized to suit your business needs. Their team will provide you with a free consultation to discuss your business goals and prepare a package specifically for your requirements. Personally, I would’ve preferred a little more transparency with their pricing. It’s clear from their website that they’re a top-class provider offering an excellent service for enterprises; however, there are no ballpark figures available on their website, which makes it difficult to compare their prices with the rest of the market. That said, after chatting with their pre-sales support, it was clear that their pricing is in line with that of similar companies. In terms of customer service, they offer telephone, email, and ticket support. For customers who encounter any hosting-related emergencies, their technical support hotline is available 24/7. Their technical support staff are excellent, in my opinion: they’re quick to respond and will resolve any issues as fast as possible. They also do not charge extra for this support, which is often the case with enterprise-level hosting providers. They also manage a Facebook page. Messages via Facebook are picked up very quickly, and support is available in both German and English. Every time I needed help, regardless of the time of day, I’ve always received a polite and helpful response. Vautron Rechenzentrum AG is an enterprise-level website hosting provider with award-winning 24/7 customer support. Their Tier III and IV data centers are located in Munich and Frankfurt. 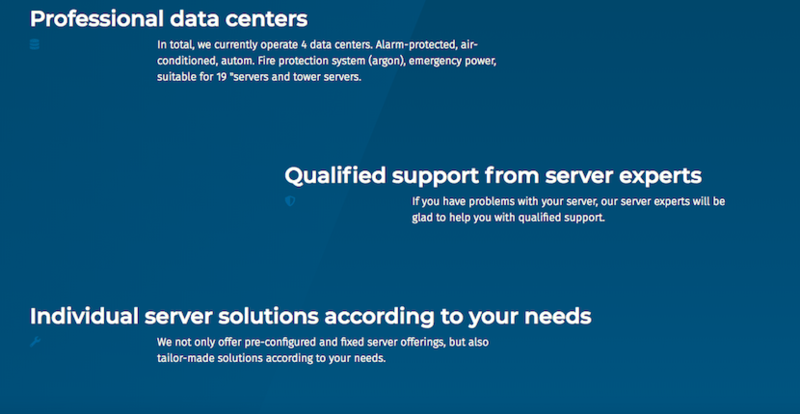 Wondering how Vautron Rechenzentrum AG stacks up against other Web Hosting companies? Enter any other Web Hosting company and we will give you a side-by-side comparison.